My wife and I are celebrating our 25th; wedding anniversary with an overseas trip, so I’m unfortunately missing a lot of the farce that passes for politics in this country. I did pick up via Twitter that Peter Dutton was complaining that his Labor opponent hadn’t moved to the electorate. This seems a strange complaint given how often they’ve suggested that Bill Shorten was overconfident and already measuring up the curtains for The Lodge which apparently as part of some austerity drive wasn’t fitted with them in the renovations. Yep, when we said that Tony would never make it to The Lodge we were right, even if only on a technicality. Whatever, Mr Dutton’s normal completely misplaced confidence did seem missing when he suggested that a candidate who was yet to win the seat should have already found a house and moved in. Is he actually suggesting that Bill should have already got quotes for removalists and worked out the most direct route to Parliament? To be fair, Petey did tell us that he was only passing on some of the things other people were saying. Unfortunately, due to a whole range of laws, I can’t repeat the things I’ve heard people say about our Home Affairs Minister. Besides, that wouldn’t be fair, would it? To say something about someone and then suggest that I was just repeating someone else’s opinion. Why, I’d probably be forced into an apology the next day even if Scott Morrison tried to suggest that there’s nothing wrong with suggesting that Ms France was “using her disability” as “an excuse”. Subtext: Disabled people do that all the time, don’t you know? Look at how upset people get when Centrelink or the NDIS ask them a simple question like, “Does your child still have Down’s Syndrome?” I mean, it’s a reasonable question. Now that ScoMo’s PM we should expect the odd miracle or two! Now, in case you haven’t noticed, I often think things are the perfect analogy only to become confused when the analogy breaks down after just a couple of sentences. In this, I’m rather like every Liberal leader we’ve had since Fraser, but unlike them, I don’t pursue the analogy for a couple of elections after it’s clearly shown to be… well, an analogy and not something you should base your whole policy development on. So, when the call came for certain groups to come first, I thought that’s it: Those who have more money and can afford business and first class go first, closely followed by those with young children and those who obviously need help. The rest of us should just wait patiently without complaint because, hey aren’t they looking after those who need it? Look how helpful we are to that man in the wheelchair? See how we allow Mum and Dad to get settled with that toddler who’ll scream all the way to Barcelona? Isn’t this a fair go for those who have a go? I did take the analogy a lot further in my head, and I had a lot to say about the whole “”fair go” slogan, but as it’s breakfast time, I won’t do a Liberal thing and pursue it by suggesting a whole franking credits scenario where the business class people get discounts off their tax for their plane tickets, but we need to give an equivalent amount to the unfortunate few business class passengers whose taxable income means they don’t pay any. No, like Malcolm Turnbull, I know when to quit. Peter Dutton didn’t. As Jay Leno said, ” If God had meant us to vote, he would have given us candidates.” I mean how many people’s minds will actually change as a result of the traipsing up and down the country of the prospective aspirants spending countless mountains of our money. May the better man win, providing always that Bill has a chance to prove himself and Morrison has a chance to reflect that slogans and waffling manifest nothing more than exactly that. As you say, Centrelink asking questions like this seems perfectly reasonable. After all, we ought to believe in miracles, right? I believe this question is asked again and again every year! After all, what is Centrelink for? They have to make sure that nobody gets unwarranted benefits. Both my husband and I, are well into our eighties. On our last overseas trip we apparently looked so feeble, that they urged us to be boarding together with parents of young children before all the other passengers. It made perfectly good sense to us, since that way we were able to take our seats without cluttering the gangway for the more mobile passengers. @Uta Hannemnn: The real miracle will be the Liarbral Party presenting any realistic policies at the 2019 Federal election that benefit Australian voters over the foreign owned multinational corporations that extract our natural resources and pay no taxation in Australia thanks to the numerous taxation exemptions, rebates, allowances etc that successive governments have allowed in the past. I am not holding my breathe …. Then, on a geographic note, I am advised that Benito Duddo has a principal residence on the Gold Cost about 100km south of Brisbane while the Dickson electorate covers inner northwest Brisbane suburbs. We are working to ease his travelling time. For the cowardly attack on ALI FRANCIS CANDIDATE FOR DIXON, obviously a terrorist attack by an emotionally insecure, psychologically disturbed individual attempting to pervert the course of Australia politics and so putting Australian national security at risk, Benito Duddo is hereby detained incommunicado under Australia terrorism legislation and incarcerated on Manus Island for the term of his natural life …. without a mobile telephone …. which would prevent him telling anybody, including immediate family, and even prevent disclosure that he was being held without legal representation. Mr Dutton relies quite a lot on hearsay and frequently he passes it on to us as is the case of his nasty remarks about Ali France his ALP opposition in Dickson. 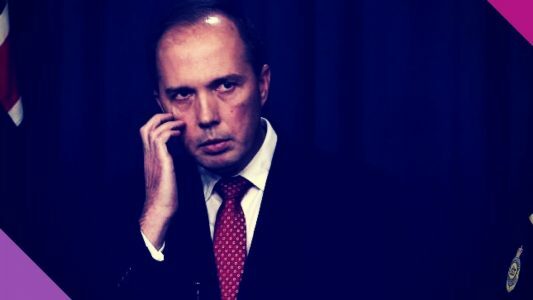 Well, Mr Dutton I have been told that you are a relentlessly lazy individual who has brought nothing of value to the positions you have held and that as Health Minister you distinguished yourself by being voted the worst such minister in our history. I’ve been told that had you wanted to, in your current job, you could have resettled the asylum seekers on Manus and Nauru several years ago and these facilities could by now have been closed. I’ve been told that you haven’t done this as you prefer to use these people for scare campaigns particularly during the run-up to an election. This is just what I’ve been told, Mr Dutton and I pass it on for your consumption. Clever, Rossleigh, those analogies can come back to bite you on the bum. Keep up the good work but don’t let the events back home impinge on your enjoyment of Spain and wherever else your travels may take you. The insanity, in one form or another when you come back, or if the unthinkable happens you would have an alternative. Nah, all good. The LNP are toast as a knowledgeable acquaintance tells me, frequently. Centrelink thinks I’m getting younger. After 6 weeks overseas, they cancelled my NSW senior’s gold Opal card, so when I landed back in Australia, I had to pay full fare on trains again, until I could have a new one delivered. Or maybe they don’t think seniors should have the right to travel overseas. Iggy, how did they know that you were on holiday overseas ? Iggy648, it seems our government is determined to make us prisoners in our own land, lol. Its as if its going to cost them more when all the evidence is it costs the government less for us to leave. Pure Ideology, nothing to do with reason. terrence, its your epassport when you leave the country. Terence Mills – you have to tell Centrelink if you are going away otherwise they get very nasty. We had our pension healthcare cards cancelled – in case we tried to use them somewhere overseas ?? Cos they work in Europe ??? It is indeed a wondrously bizarre system. Thanks Rossleigh, have a great trip.